Sitting down with Bob North was amazing. How else do you describe someone who has swum across Lake Erie and at the age of 63 can swim 100 yards in 56 seconds – competing with local high school and college swimmers for the title of Fastest Swimmer in Erie County and Highmark Quad Swim Champion?! Bob may be one of those athletes that has accomplished more after graduating from IUP as a varsity athlete. Like many college athletes he took a few years off after graduation and in his 30’s started reading about this athletic event call the Quad Games. He used the Quad as motivation to get back into swimming shape and surprisingly found that he also enjoyed biking and skiing. After competing in the Quad Games for a couple years, Bob was at the Quad Awards Banquet when he overheard Harvey Snell talking about swimming across Lake Erie. This got the wheels turning, Bob thought, “maybe I can get in really good shape one more time,” by training for this lake swim. So, at the age of 34 he started training for the 24.3 mile swim from Canada to Erie and he did it! Fast forward a few years and life got busy. Bob moved to North East, his commute to work got longer and his training time got shorter. At the time he was a teacher at Iroquois High School and managed the lifeguards at Presque Isle State Park. In 2012, Thad Urban, Assistant Superintendent at Iroquois, talked Bob into competing in the 30th Annual Highmark Quad Games as a part of the wellness program for Iroquois School Distract. That year, the ski event was postponed four times. Bob was pretty thankful because this gave him four more weeks to train. The Highmark Quad and the Quad Father (Craig Latimer) are the major reasons why Bob has fallen in love with skiing and looks forward to our crazy north east, PA winters. When Bob retired in 2017, one of the things he was most excited about was being able to ski more! Bob may have retired but he still is the Lifeguard Manager at Presque Isle and Swim Coach at Iroquois High School. Being around so many young and talented swimmers, has to be major motivation! He swims every morning to help stay fit. He isn’t scared to jump in the water and swim head-to-head with some of his athletes. In fact, at the 2017 Highmark Quad Swim event he did toe the starting blocks with one of his former swimmers. 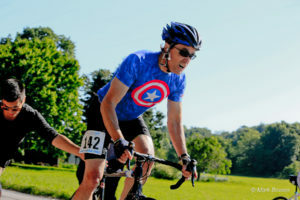 You may not find Bob on the top of the podium at every Highmark Quad event, but he normally finishes in the top ten, in a very competitive age group. He sets little goals throughout the year and feels his real motivation is to keep feeling young and energetic. He looks up to the likes of Merv Troyer and Bob Moomy who are still competing in the Quad Games in their 80s! Bob says that movement is like medicine, it keeps his back and body feeling good and is a part of his daily routine. Bob has embraced an active Highmark Quad lifestyle and you can tell. When you first meet him, you would guess he was in his 40’s and if you met him at the Quad Swim, you might think he’s in his 20’s. Athletes like Bob North are what has made the Highmark Quad Games one of the area’s premier athletic events for 36 years. If you are looking for that magic pill to help you lose weight, increase your energy levels and/or keep you feeling and looking young? Try out the Highmark Quad Games, it has worked for Bob and it may just work for you!